WH to Regulate Cow Flatulence? As part of its plan to reduce U.S. greenhouse gas emissions, the Obama administration is targeting the dairy industry to reduce methane emissions in their operations. This comes despite falling methane emission levels across the economy since 1990. 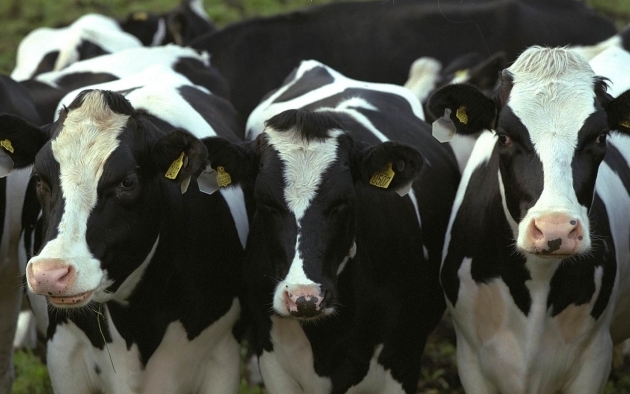 The White House has proposed cutting methane emissions from the dairy industry by 25 percent by 2020. Although U.S. agriculture only accounts for about 9 percent of the country’s greenhouse gas emissions, according to the Environmental Protection Agency, it makes up a sizeable portion of methane emissions — which is a very potent greenhouse gas. Some of these methane emissions come from cow flatulence, exhaling and belching — other livestock animals release methane as well. “Of all domestic animal types, beef and dairy cattle were by far the largest emitters of [methane],” according to an EPA analysis charting greenhouse gas emissions in 2012. Cows and other animals produce methane through digestion, which ferments the food of animals. It’s not just the dairy industry that the Obama administration is clamping down on. The White House is looking to regulate methane emissions across the economy from agriculture to oil and gas operations — all this despite methane emissions falling 11 percent since 1990. Methane emissions have largely been reduced because of the incentive for companies to capture it and sell it for monetary gain. Oil and gas companies, for example, have been looking for ways to increasingly capture methane leaked from drilling operations which they can then sell. Environmentalists have been pushing the Obama administration to crack down on methane emissions for some time, arguing that they drive global warming and pollute the air and water. Activists have argued that the methane leakage rate from natural gas operations is 50 percent higher than the EPA estimates. Republicans and the oil and gas industry argue that the methane leakage rate has been estimated to be 50 times lower than the EPA’s estimate. The GOP argues that the EPA’s estimate is simply an attack on hydraulic fracturing, or fracking. Note: This information (in the public domain) is provided as neither an endorsement nor a disclaimer of it's content and printing this page drops the image.